1. Submit. Give up. Make room for the miracle. 2. Inform yourself. Listen to your intuition. Examine all the options, but only use what feels right to you. 3. Accept support. Surround yourself with loving friends, healing music, special colors, prayer and affirmation. 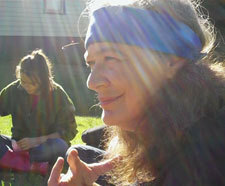 Create a ceremony of healing/wholing and invite your supporters. 4. Anoint your breast(s) with healing herbal oils such as calendula, dandelion, or poke. Visualize healing energies suffusing your tissues. -	Use organic olive oil and butter to the exclusion of other fats. -	Increase your use of beans, especially lentils, and fermented foods such as yogurt, sauerkraut, miso, tamari, homemade wines and beers. •	Daily use of a nourishing infusion, especially red clover flower or burdock root or violet leaf infusions. •	Daily use of fresh herb vinegars, especially yellow dock, burdock, and dandelion root vinegars. •	Frequent use of a long-cooked soup containing seaweed (such as kombu or wakame), astragalus root, and medicinal mushrooms (reishi, shiitake, puffballs, etc). 6. Increase you exercise level. Take a yoga or tai chi class weekly. Walk daily. Get a weekly massage. Pamper yourself with activity. -	always combine drug use with complementary herbs. For instance, protect the liver with milk thistle seed tincture. -	be willing to set limits that you feel comfortable with - they can't take your lymph glands if you say "No."